Not since 1996, the year in which FDA had approved Latanoprost, has another class of glaucoma drugs been marketed. However, now there is a distinct possibility that drugs which improve outflow through the trabecular meshwork could be approved. Among those agents which enhance aqueous outflow through the conventional pathway (so-called “pharmacologic trabeculectomy”), the ROCK-inhibitors show the most promise. The trabecular meshwork cells exhibit a smooth-muscle like phenotype based on their expression of various smooth muscle specific proteins including α-smooth muscle actin (α-SMA) and CPI-17 (Protein kinase C-potentiated protein phosphatase-1 inhibitor protein). Numerous microfilament-based structures are also found in cells of the outflow pathway. These include focal contacts, adherens cell-cell junctions and bundles of microfilaments. The regulation of trabecular meshwork contractility is under calcium-dependent and calcium-independent mechanisms. Smooth muscle contraction is predominantly regulated by the phosphorylation of Myosin Light Chain (MLC). MLC is phosphorylated by calcium/calmodulin-dependent MLC kinase (MLCK) and dephosphorylated by calcium-independent MLC phosphatase (MLCP). Apart from Ca++ concentration, MLC phosphorylation can be modulated via signaling pathways such as the Rho/Rho kinase pathway. The trabecular meshwork and ciliary muscle are known to express many components of the Rho signaling pathway such as ROCK1 & ROCK2, RhoA, MLC, MLCK and MLCP. ROCK activity through the Rho signaling pathway is thought to be a key player in regulating the cellular morphology and contractility of the conventional outflow pathway. The Rho family consists of 3 small guanosine-triphosphate (GTP) binding proteins RhoA, RhoB, and RhoC. These proteins regulate cell shape, motility, proliferation, and apoptosis throughout the body. Rho binds to GTP, activating its downstream effector molecules (ROCK1 and ROCK2). 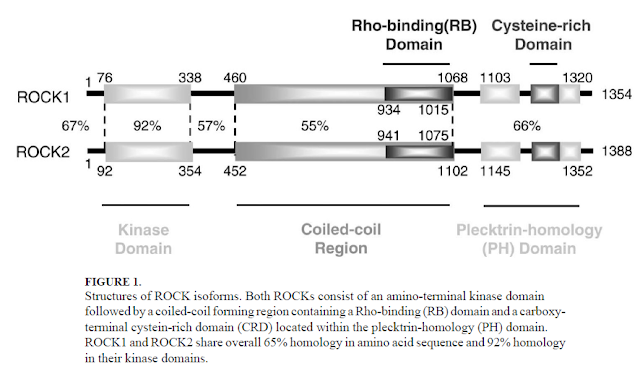 The Rho-associated coil-forming protein kinases (ROCK) are protein serine/threonine kinases. They occur in 2 isoforms: ROCK1 and ROCK2. The former is located on chromosome 18 and contains 1354 aminoacids. The latter is located on chromosome 12 and encodes a 1388 aminoacid product. In humans ROCK1 and ROCK2 are expressed in majority of tissues, including the trabecular meshwork and ciliary muscle cells. 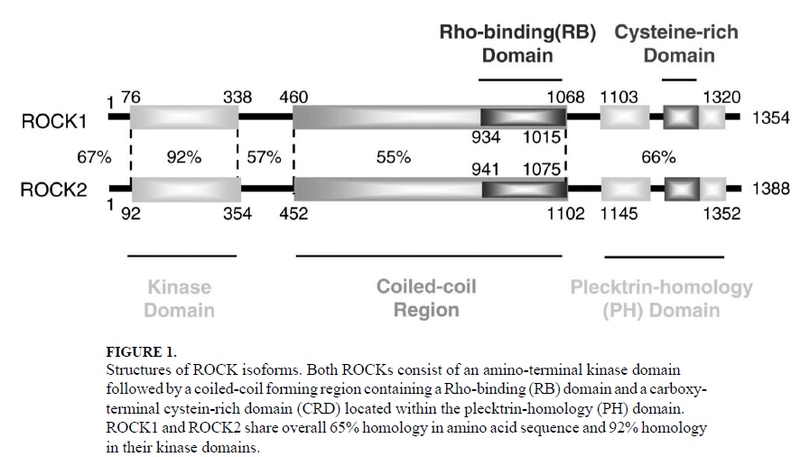 The 2 isoforms of ROCK are the downstream targets of the small GTP-binding protein: Rho. The Rho GTPases act as molecular switches by cycling between an active GTP-bound and an inactive GDP-bound form. On binding to Rho, the catalytic activity of ROCKs is moderately enhanced. ROCKs mediate a number of important cellular functions such as cell shape, motility, secretion, proliferation and gene expression. ROCKs also mediate RhoA-induced actin cytoskeletal changes by inhibiting MLCP. These directly affect the contractile properties of the trabecular meshwork outflow tissues. ROCKs also activate LIM-kinases which stabilize filamentous actin to reduce the occurrence of cell migration. Regulation of the movement and shape of cells through its action on the cellular cytoskeleton. Contribution to abnormal accumulation of extra-cellular material (ECM hypothesis). Anterior chamber perfusion with metalloproteinases, which digests ECM is found to improve outflow. Changes in the contractile activity and cell adhesive interactions of the cells of aqueous outflow pathway (Contractility hypothesis). Experimental disruption of the actin cytoskeleton of the trabecular meshwork decreases outflow resistance, while the trabecular meshwork of patients with primary open angle glaucoma is stiffer than that of age-matched controls, contributing to the contractility hypothesis. It is hypothesized that there is an increased expression of Rho/ROCK pathway in the outflow tissues in glaucomatous eyes. These actions of ROCK lead to increased resistance to aqueous humor outflow through the trabecular meshwork. ROCK-inhibitors induce reversible modifications to cell morphology and cell interactions in the eye that facilitate greater outflow of aqueous humor through the trabecular meshwork and ultimately lower the intra-ocular-pressure (IOP). ROCK-inhibitors uncouple actin from myosin, 2 proteins which interact to contract the ciliary muscle. Thus, specific components of the cellular cytoskeleton are disrupted, reducing the contractile tone of the tissues of the conventional outflow pathway. By inhibiting Rho-kinase actin-myosin contractility, it also allows the cells to relax. This creates space between the cells through which fluid can exit from the eye. ROCK-inhibitors also increase ocular blood flow in the optic nerve head by relaxation of the vascular endothelial smooth muscle. Nitric oxide induced impairment of optic nerve blood flow was reportedly prevented by the ROCK-inhibitor Fasudil. ROCK-inhibitors also have a vasodilatory effect, which may lead to reduced episcleral venous pressure. ROCK-inhibitors have been found to influence neuron survival and axon regeneration. In a study, Fasudil protected against glutamate-related excitotoxicity in the retina and better preserved cells of the ganglion cell layer on exposure to N-methyl-D-aspartate. ROCK-inhibitors block TGF-β myofibroblast transdifferentiation of human tendon fibroblasts which suggests that ROCK-inhibitors may reduce postoperative scarring after glaucoma filtering surgery. Side effects of ROCK-inhibitors include mild conjunctival hyperemia, which spontaneously resolves over several hours. This is assumed to be due to the vasodilatory effect of the drug. It is seen in 50-60% of the treated individuals. By instilling the drug at night, there could be a symptomatic decrease in the frequency of this side effect. Small conjunctival hemorrhages and cornea verticillata (seen in patients who are on concurrent systemic amiodarone) are also seen. These features are asymptomatic and do not reduce visual function. Higher concentrations of ROCK-inhibitors may affect other protein kinases in the body including Protein kinase A, Protein kinase C and MLCK among others. ROCK-inhibitors lower blood pressure and reduce vascular resistance. This could be detrimental in the elderly. 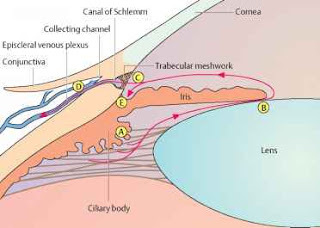 ROCK inhibition was also found to reduce the intraocular penetration of concurrent Timolol instillation (presumably by increasing the elimination through dilated conjunctival vasculature). However, no significant systemic side-effects have been reported with these agents. Although a number of ROCK-inhibitors were studied, yet only few have reached Phase 3 trials. Among them Netasurdil, Roclatan and Ripasudil are prominent. The last is available only in Japan. 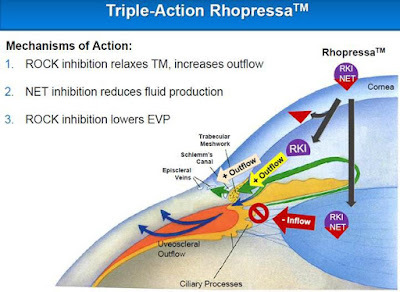 Netarsudil 0.02% (Rhopressa) lowers IOP by inhibiting ROCK and the norepinephrine transporter (NET). The former action enhances trabecular outflow and reduces episcleral venous pressure; while through NET it decreases aqueous production. Conversely, Ripasudil, is purely a ROCK-inhibitor. Roclatan (PG-324) is a once-daily eyedrop which combines a fixed dose Netasurdil 0.02%(Rhopressa, AR-13324) with Latanoprost 0.005%. Increasing aqueous outflow through the trabecular meshwork. Phase 1,2, and 3 clinical trials of Netarsudil were conducted on more than 2000 patients. 0.02% once daily in the evening was found to be the most efficacious and well tolerated dosing regime. The phase 2 clinical trial included comparison with Latanoprost. IOP reductions in both groups were similar (-5.8 mmHg in Netarsudil vs 5.9 mmHg in the Latanoprost group). Among all patients Netarsudil was 1 mmHg less effective than Latanoprost (-5.7 vs 6.8 mmHg) and did not meet the statistical analysis for noninferiority of Netarsudil to Latanoprost. Rocket 1,2,4 phase 3 trials compared Netarsudil to Timolol. All studies showed comparable IOP reduction with both drugs. Mercury 1 and 2 have shown 1-3 mmHg greater IOP lowering with Roclatan compared to the individual components (Netarsudil and Latanoprost). IOP reductions of atleast 30% were achieved in 65% of patients treated with Roclatan, compared to 40% when individual components were used. In phase III, Mercury 2 trials, Roclatan achieved successful efficacy results. Roclatan treated patients achieved 16 mmHg or less IOP in 61% cases, while ≤14 mmHg was achieved in 33% cases. This was comparable to those treated with individual components in whom similar results were achieved in 40% or less and 15% or less respectively. The product was well tolerated with a 10% discontinuation rate. The advent of new drugs, which modulate aqueous outflow through the trabecular meshwork, which is a more physiological route, might have a positive correlation to IOP control in glaucoma/Ocular hypertension patients. According to one theory, by giving prostaglandin-analogues, we increase uveo-scleral outflow and further reduce the activity of the conventional outflow pathway. Thus, ROCK-inhibitors may prove to be an important milestone in glaucoma management. Thanks for your post. Glaucoma is a disease that should be treated at the earliest possible stage to prevent blindness. For this reason, DentalSave offers exciting Vision plans to get discount in glaucoma treatment.